Jane Trigère and Ken Schoen of the Jewish Historical Society of Western Massachusetts located in the old fire station in South Deerfield. SOUTH DEERFIELD — It’s a strange setting for something called the Jewish Historical Society of Western Massachusetts: a former firehouse that’s now home to one of this village’s few Jewish couples, as well as to their book shop. 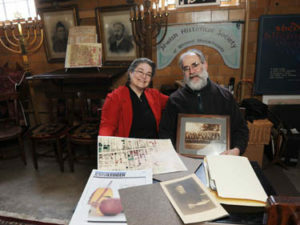 But the fledgling organization has been gradually collecting photos, documents, fliers and other bits of Jewish memorabilia from around the four western counties as bookseller Ken Schoen and artist Jane Trigère add to a collection that has at its core a few dozen videotaped oral histories. ‘A memory bank for the Jewish community,’ is how the couple describe their efforts to document and preserve the community life of western Massachusetts Jews. ‘We’ve always enjoyed talking with older people in the valley about their lives and getting their stories,’ said Schoen, who like his wife grew up elsewhere, accompanying their parents visiting older relatives and listening intently to their stories. And so the taping of residents at Ruth’s House began. Where South Deerfield’s fire trucks once were parked, the couple has collected thousands of volumes of German Judaica, books on the Holocaust, exile and refugee writers, Israel, and psychoanalysis for sale online and at the Schoen Books retail store set up in 1994. There’s also a growing collection of materials, such as a bound collection of the Jewish Weekly News before the western Massachusetts publication merged with the Jewish Advocate in 1998 and later was bought by the Connecticut-based Jewish Ledger. After years of fruitlessly asking people at their synagogue, Congregation B’nai Israel in Northampton, if anyone was interested in forming a Jewish historical organization, Trigère said she realized the timing was right: three of Springfield’s Orthodox synagogues are folding, as a reflection of a shrinking population and financial difficulties. She and Schoen began documenting the closing days of the Kodimoh, Kesser Israel and Beth Israel synagogues, which have merged as the Alliance of Orthodox Congregations and are preparing to move into what has been Congregation B’nai Jacob. B’nai Jacob, which was originally built as an Orthodox synagogue but became a Conservative congregation in the 1960s, is merging with Conservative Congregation Beth El, across the street. All of the synagogues are concentrated in the same area, south of the city, near Forest Park, where the Orthodox community relocated from Springfield’s North End. One elderly woman, whose father was a ritual kosher slaughterer and ritual circumcision ‘moel,’ even donated his professional knives to be part of their collection. A wooden bench donated from B’nai Jacob’s original home in the North End is prominent amid the file cabinets, shelves and cartons of materials, but she said people are too upset, depressed and even somewhat traumatized by the notion of losing their congregations’ identity to surrender them — especially when there’s a desire to see some of them displayed in the new Alliance location. Apart from being, in some ways, an extension of the book business — providing scholarly tomes on Jewish history, life and culture — the historical society also will try to reflect the vitality of Jewish communities in places urban and rural. To do that, Schoen and Trigère are seeking board members from around the region, as well as members and volunteers to help transcribe some of the oral histories they’ve collected. And they’re training teachers at Jewish schools around the region to show their students how to collect stories as well. What the Deerfield-based organization — which may wind up setting up exhibits in the former firehouse — shows also is that the vitality of the Jewish culture has moved farther up the valley, he said. But if the Jewish population in Northampton, Amherst and Greenfield seems to be livelier, with an annual film festival, plans for an expanded National Yiddish Book Center and even talk about moving the Holocaust center from Springfield to Amherst, Trigère said, the synagogues in the Franklin and Hampshire counties are also struggling because of splintering into sub-groups and financial problems. The couple, who believes their new organization is the only Jewish historical society of its kind in Massachusetts, said there’s more of a Jewish financial legacy among families in Springfield who have been there since the 1920s, ’30s and ’40s. The less urban upper valley consists more of Jewish transplants — ‘professors, potters and potheads,’ who are not part of multi-generational communities and are disconnected from the structure of Jewish organizations. ← March 2009: Oral historians in training!